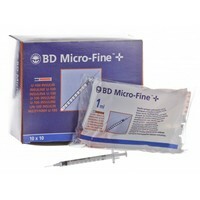 BD Microfine + 1ml U100 Insulin Syringes are disposable hypodermic syringes made from durable plastic that is safe, non-toxic and non-pyrogenic. Designed with a latex free piston and complete with a 29G x 12.7mm bevelled needle, the syringes offer a more comfortable and convenient method of injecting Insulin. The syringes hold up to 1ml of Insulin and are marked in clear graduations of 0.02ml (1 unit) for easy and accurate dosing. Suitable for U100 Insulin only.